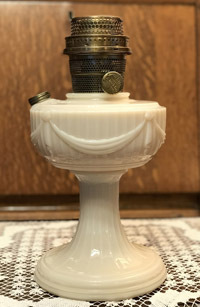 The short Lincoln drape lamps are one of the most reproduced lamps. 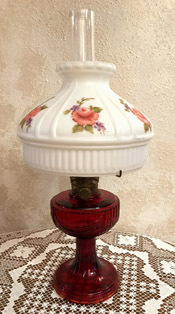 The new lamps however are quite easy to identify since the threads that accept the burner on the reproductions are part of a metal collar which is glued to the glass rim at the top of the font. 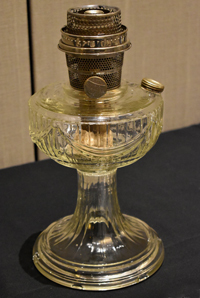 The original short Lincoln drape lamps have the metal burner threads inserted down into the glass opening of the font itself. I have provided pictures to demonstrate the difference in the burner threads. Also the newer lamps are made in two pieces with the foot being glued to the glass font. 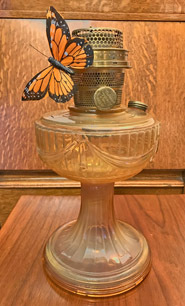 The original lamps were molded in one piece. The newer lamps use the model-23 burner, while the original short Lincoln drape lamps use the model-B burner. The two burners can however be interchanged. 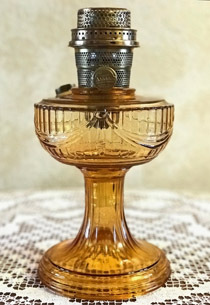 Some of the original short Lincoln drape lamps have a larger foot referred to as a "Solitaire foot". It is larger and of a more "stepped" design than the normal foot of the short Lincoln drape. The name "Lincoln drape" refers to the drape design molded into the glass font, which resembles the drape design used on president Lincoln's casket. Comparison of normal and "Solitaire foot"